The dirtier the sport, the more colorful the apparel, it seems. This years release from Bell will be no exception. Featuring the SX-1, MX-2, and Moto 9 helmets, these new skins will shine brightly ... until you hit that big puddle of mud. 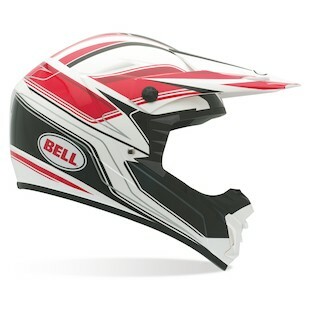 The SX-1 helmets get two new graphics editions, starting with the Bell SX-1 Tracer Helmet. A high contrast Red/White/Black design combines larger bands with detailed pin striping for a sharp look. 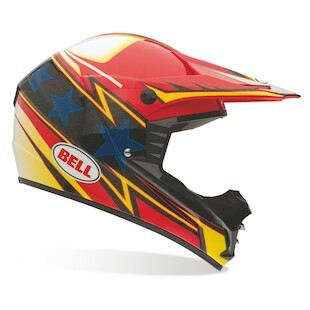 Vividly produced, the Bell SX-1 Apex Helmet has an electric Red and Gold design splashed with a Black and Blue starred stripe. This psychedelic combination is liable to shine right through all that dirt you are going to plaster on it. Moving up the ladder, the MX-2 line gets the next addition. 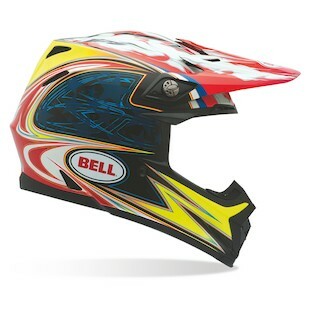 A kaleidoscope of color, the Bell MX-2 Tagger Transition Helmet makes a unique impression. While the main color blocking is done in Black/Orange/Blue, a finer detailing of High-Viz pin striping separates the color panels. Finally, the Moto 9 series get one hallucinogenic home run. This graphic is also available on the Bell Star and as I had described for that post: it basically looks like Flash, Wonder Woman, and the Thundercats all got into a fight. 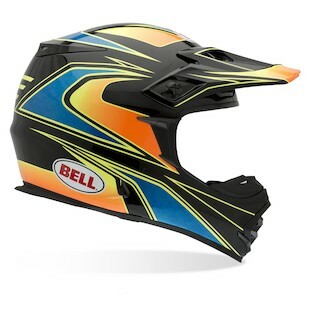 Regardless of who won, the Bell Moto 9 Carbon Airtrix Laguna Helmet is sure to turn heads. These colorful eye candies are just a taste of what the Bell 2013 offering contains.